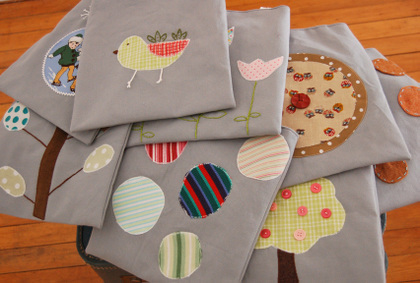 SouleMama: In the Shop: Tiny Totes! In the Shop: Tiny Totes! Yay! I'm so excited about these, that I've had in mind to make for a bit now. I've been wanting to make some totes that each one would be unique and one-of-a-kind and 'new' and creative to me when making them, and I wanted them to appeal to both children and fun-loving adults, all while staying as affordable as possible. I think I did it! Let's call them Tiny Totes, shall we? (Indulge me, if you will). I put a batch of them in the SouleMama Shop on Etsy (the photos above will take you to their individual pages). I've got sketchbook pages full of more ideas for them (they feel like little blank canvases of embroidery, applique, and patchwork fun! ), so if you like them too, then I'll make one more round of them before the holidays (am I really saying that word like it's something that will happen soon?). I've got a few other things I'm cooking up for holiday treats, particularly with little ones in mind, so if you're interested, peek at the Shop for updates. And as always, thanks so much for your support of what I do! Thank you, Thank you! They've all sold! I'll make another round in the beginning of November!